Arktis Parka is a long, extremely durable down parka that keeps you warm even when the temperature plunges. Perfect for when you want to enjoy silence, relaxation and adventure in cold weather. Reinforcements in G-1000 HD in the front, on the sleeves and in the rear offer extra protection against snow and moisture. The primary material is breathable G-1000. Many smart functions and pockets. For example, the large breast pockets can hold a thermos while the smaller pockets on the outside are perfect for keys, a compass and multi tools. There are two large bellow pockets at the hem and two pockets with comfortable fleece lining to keep your hands warm. There are also two large mesh pockets in stretch and one zippered pocket on the inside for a mobile or GPS. 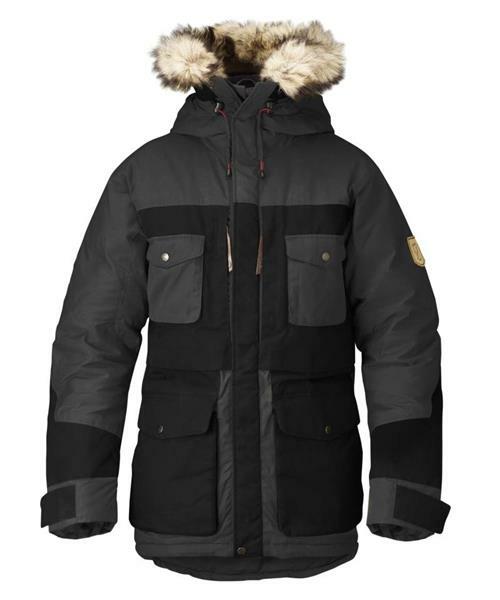 Adjustable hood with detachable, warm synthetic fur trimming that protects against snowstorms. Snow lock and drawcord at the hem and adjustable sleeve cuffs.